Do not force a compact disc into the CD insert slot. This could damage the CD and/or CD changer/player. Trying to load a CD with the CD door closed could damage the CD and/or CD changer. Only one CD can be loaded into the CD player at a time. Only use high quality 12 cm (4.7 in) round discs that have the “COMPACT disc DIGITAL AUDIO” logo on the disc or packaging. During cold weather or rainy days, the player may malfunction due to the humidity. If this occurs, remove the CD and dehumidify or ventilate the player completely. The player may skip while driving on rough roads. The CD player sometimes cannot function when the compartment temperature is extremely high. Decrease the temperature before use. Do not expose the CD to direct sunlight. CDs that are in poor condition or are dirty, scratched or covered with fingerprints may not work properly. MP3 — MP3 is short for Moving Pictures Experts Group Audio Layer 3. MP3 is the most well-known compressed digital audio file format. This format allows for near “CD quality” sound, but at a fraction of the size of normal audio files. MP3 conversion of an audio track from CD-ROM can reduce the file size by approximately a 10:1 ratio with virtually no perceptible loss in quality. MP3 compression removes the redundant and irrelevant parts of a sound signal that the human ear does not hear. Bit rate — Bit rate denotes the number of bits per second used by a digital music file. The size and quality of a compressed digital audio file are determined by the bit rate used when encoding the file. Sampling frequency — Sampling frequency is the rate at which the samples of a signal are converted from analog to digital (A/D conversion) per second. ID3 tag — The ID3 tag is the part of the encoded MP3 file that contains information about the digital music file such as song title, artist, album title, encoding bit rate, track time duration, etc. ID3 tag information is displayed on the Album/Artist/Track title line on the display. Playback order of the CD with compressed files (MP3) is as illustrated. The names of folders not containing MP3 files are not shown in the display. 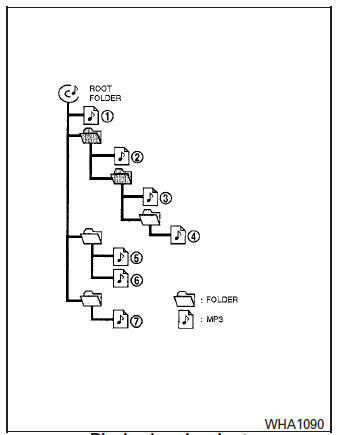 If there is a file in the top level of the disc, “ROOT” is displayed. The playback order is the order in which the files were written by the writing software; therefore, the files might not play in the desired order. *Files created with a combination of 48 kHz sampling frequency and 64 kbps bit rate cannot be played. WARNING Do not connect, disconnect or operate the USB device while driving. Doing so can be a distraction. If distracted you could lose control of your vehicle and cause an accident or serious injury. The vehicle is not equipped with a USB device. USB devices should be purchased separately as necessary. This system cannot be used to format USB devices. To format a USB device, use a personal computer. In some jurisdictions, the USB device for the front seats plays only sound without images for regulatory reasons, even when the vehicle is parked. This system supports various USB memory devices, USB hard drives and iPod® players. Some USB devices may not be supported by this system. Partitioned USB devices may not play correctly. Some characters used in other languages (Chinese, Japanese, etc.) may not appear properly in the display. Using English language characters with a USB device is recommended. Notes for iPod® use (if so equipped): iPod® is a trademark of Apple Inc., registered in the U.S. and other countries. Improperly plugging in the iPod® may cause a checkmark to be displayed on and off (flickering). Always make sure that the iPod® is connected properly. An iPod® nano (1st Generation) may remain in fast forward or rewind mode if it is connected during a seek operation. In this case, please manually reset the iPod®. An iPod® nano (2nd Generation) will continue to fast-forward or rewind if it is disconnected during a seek operation. An incorrect song title may appear when the Play Mode is changed while using an iPod® nano (2nd Generation). Audiobooks may not play in the same order as they appear on an iPod®. Large video files cause slow responses in an iPod®. The vehicle center display may momentarily black out, but will soon recover. If an iPod® automatically selects large video files while in the shuffle mode, the vehicle center display may momentarily black out, but will soon recover. Some characters used in other languages (Chinese, Japanese, etc.) are not displayed properly on the vehicle center screen. We recommend using English or Spanish language characters with an iPod®. Large video podcast files cause slow responses in the iPod®. The vehicle center display may momentarily black out, but it will soon recover. If the iPod® automatically selects large video podcast files while in the shuffle mode, the vehicle center display may momentarily black out, but it will soon recover. The iPod® nano (2nd Generation) will continue to fast forward or rewind if it is disconnected during a seek operation. An incorrect song title may appear when the Play Mode is changed while using the iPod® nano (2nd Generation). Audiobooks may not play in the same order as they appear on the iPod®. The iPod® nano (1st Generation) may remain in fast forward or rewind mode if it is connected during a seek operation. In this case, please manually reset the iPod®. If you are using an iPod® (3rd Generation with Dock connector), do not use very long names for the song title, album name or artist name to prevent the iPod® from resetting itself. Bend the cable excessively (40 mm [1.6 in] radius maximum). Twist the cable excessively (more than 180 degrees). Pull or drop the cable. Do not force the iPod® cable connector into the device port. Close the center console lid on the cable or connectors. Store objects with sharp edges in the storage where the cable is stored. Spill liquids on the cable and connectors. ● Do not connect the cable to the iPod® if the cable and/or connectors are wet. It may damage the iPod®. If the cable and connectors are exposed to water, allow the cable and/or connectors to dry completely before connecting the cable to the iPod® (wait 24 hours for it to dry). If the connector is exposed to fluids other than water, evaporative residue may cause a short between the connector pins. In this case, replace the cable, otherwise damage to the iPod® and a loss of function may occur. If the cable is damaged (insulation cut, connectors cracked, contamination such as liquids, dust, dirt, etc., in the connectors), do not use the cable and contact a NISSAN dealer to replace the cable with a new one. When not in use for extended periods of time, store the cable in a clean, dust-free environment at room temperature and without direct sun exposure. Do not use the cable for any other purposes other than its intended use in the vehicle. *iPod® is a trademark of Apple Inc., registered in the U.S. and other countries.